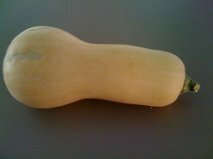 Recently a friend accidently grew a Butternut Pumpkin in her compost heap. She doesn’t cook, so very kindly gave me the pumpkin, which was big enough to have won a prize at an agricultural show. Cook the onion in the butter, then add all of the other ingredients. Bring the soup to a boil, then reduce to a simmer for about half an hour. Either use a food processor or blender to make the mixture smooth (I used a hand held masher and He Who Eats All of Our Leftovers complained that the soup was too lumpy). 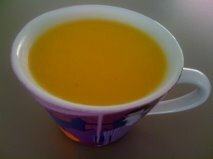 Re-heat the soup before serving.